In today’s highly-conflicted world, expert mediation at the civic, national and international levels is in increasing demand. Whether it be couples seeking a divorce, neighborhood disputes or intractable political conflicts – it is of vital importance that people listen to one another and find common ground. Since 2003, TAU’s Gershon H. Gordon Faculty of Social Sciences has been operating the Evens Program in Conflict Resolution & Mediation, founded by the Olivestone Trust. The MA program imparts knowledge in the theory and practice of conflict mediation, as well as practical skills for negotiation. It also includes a Mediation Center for settling disputes out of court; and the monthly Peace Index poll, which gauges the reactions of the Israeli public to developments in the Israeli-Palestinian peace process. The Program has graduated some 425 students, who today hold positions in the Israeli political, diplomatic, legal and business communities. It has achieved a 60% success rate for resolving cases at the Mediation Center, one-third more than the national average as reported by the Israel Bar Association. The Evens Program’s expansion was marked at a special ceremony held in the presence of the program’s benefactor, TAU Governor Corinne Evens; Olivestone Trustee Cedric Olivestone; President of Olivestone Trust, Joseph Steinman; and Projects Director of Olivestone Trust, Ms. Michal Caspi. 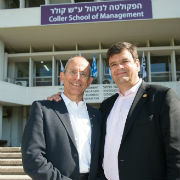 Representing TAU were Chairman of the Department of Public Policy Prof. Itai Sened and Head of the Evens Program Prof. (emer.) Ephraim Ya’ar. 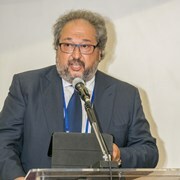 The new funding will provide for an increase in the number of graduate students through generous scholarships; activities at the Mediation Center that will target groups from diverse ethnic and economic backgrounds; increased research on the Israeli-Palestinian conflict; a joint conference on trauma with TAU’s Sagol School of Neuroscience; and a joint conference with Sciences Po, Paris, aimed at presenting a more balanced picture of Israel to young people in Europe. TAU President Joseph Klafter said at the ceremony, “Ms. Evens’ interest in collaboration very much corresponds with TAU’s own interdisciplinary and international orientation. I want to praise Corinne and the Olivestone Trust for supporting a field that gets people to listen to one another and find common ground. 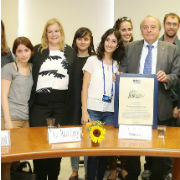 I am happy and thankful that Tel Aviv University can take an active part in this noble goal,” he said. Prof. Klafter presented Ms. Evens with a special Presidents Circle Pin reserved for TAU’s most generous donors. Accepting her certificate of recognition, Ms. Evens spoke of her excitement about the new components in the program including the trauma conference and the conference with Sciences Po. Following the ceremony, a workshop was held with presentations by young faculty recruits, including by Dr. Nimrod Rosler, a social psychologist studying the influence of community and national leaders on conflict resolution and mediation; Dr. Shira Mor, a psychiatrist specializing in conflict resolution in the workplace; and Dr. Sami Miarri, an economist studying the interface between economics and conflict.